A low-priced alternative for accurate laser wavelength measurement. The 521 Series Laser Wavelength Meter is for scientists and engineers who need to know the absolute wavelength of their CW laser, but do not need to know it to the highest accuracy available. The model 521 is a unique system that couples accurate wavelength measurement and affordability in a compact instrument. 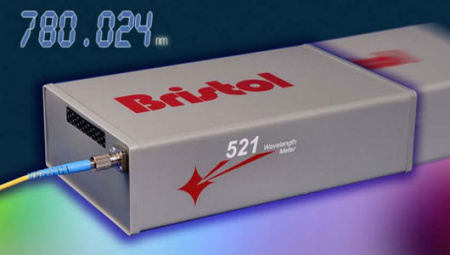 The 521 Laser Wavelength Meter measures absolute wavelength of CW and quasi-CW lasers to an accuracy of ± 10 parts per million (± 0.01 nm at 1000 nm). This system uses Michelson interferometer-based technology that is similar to that used by the Bristol Instruments’ model 671, the most precise laser wavelength meter available. The primary difference is that a Moiré scale is used as its built-in reference. This high-resolution scale provides the continuous calibration that is necessary to guarantee the accuracy of the wavelength measurement. For even greater confidence, the Moiré scale can be calibrated periodically using a simple procedure with any red HeNe laser input. Two versions of the 521 Laser Wavelength Meter are available to satisfy the needs of most experiments. The 521-VIS operates over the wavelength range of 400 to 1100 nm, and the 521-NIR has an operational wavelength range of 520 to 1700 nm. The 521 Laser Wavelength Meter operates with a PC, running under Windows, via a high-speed USB interface. Software is provided to control measurement parameters and to report data, or the system can become part of an experiment using a library of commands for custom or LabVIEW programming. Th21e laser under test enters the 521 system through a pre-aligned fiber-optic input connector to ensure optimum alignment. 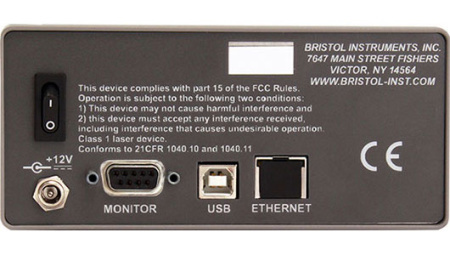 For free-beam lasers, the LC-1 Fiber-Optic Input Coupler is offered as a simple way to launch into fiber.